2 monsters with the same Type, except Tokens You can only Link Summon “Akashic Magician(s)” once per turn. If this card is Link Summoned: Return all monsters this card points to to the hand. Once per turn: You can declare 1 card name, excavate cards from the top of your Deck, equal to the total Link Rating of the Link Monsters co-linked to this card, then if you excavated any copies of the declared card, add them to your hand, also send the remaining cards to the GY. 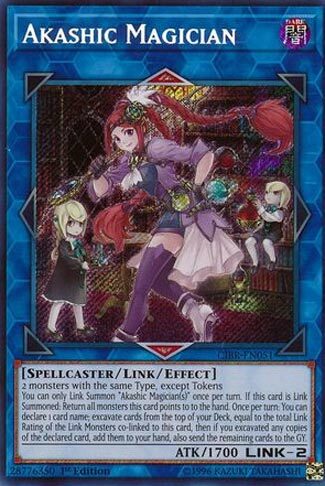 Akashic Magician has become a wanted card due to her combo ability with cards like Grinder Golem. For decks that run one Type like Spellcasters, Akashic Magician can be a useful card. Only needing two with the same Type (no Tokens), you will get a bounce of a monster that she points to. Grinder Golem, Lava Golem, or Kaiju monsters are main targets for this combo (especially Grinder). This can let you bounce your own monster as well and summon it again to gain its effect. She can help you thin your deck if co-linked, and potentially add to your hand. At the worst, you’ll get some cards in the grave, which may be the goal of the effect for most players. The higher the link, the higher the mill. Right now she is mainly a combo card with bouncing an opponents monster that you give them, but she could become something more. Coming in at number 4 is Akashic Magician, a Link-2 Dark Spellcaster-type Link Monster with 1700 Atk and T and B Arrows. She requires any two monsters of the same type to Link Summon properly but she can’t be summoned via tokens. That’s a minor attempt at balance. The real balance comes because she can only be Link Summoned once per turn. Her effects better be great. Oh look, she bounces monsters that happens to be in zones she points to. Then, depending on the number of Links that are co-linked to her, you can excavate that same number of cards to look for any one card to add to your hand. The rest go to the grave, potentially gaining effects. It’s a once per turn effect, but it can be extremely important in certain decks. This makes me wish Shaddoll Construct was back. Kaijus, a little Akashic Magician, and Secret Village of the Spellcasters could be very fun. She definitely has potential. Definitely a must own. Akashic Magician is a Link-2 pointing Up and Down and requires two monsters with the same Type, except Tokens. With the Grinder Tokens that Grinder Golem gives you, you can go into Link Spider and/or Linkuriboh and use them to summon this, so the Token part is sorta irrelevant. Akashic Magician bounces back every card this card points to, so you take back the Grinder Golem you gave the opponent and use it again, assuming you summoned it near the Extra Monster Zone, which you should be doing. If not using Grinder Golem, you can bounce back Kaijus. With Grinder Golem now back in the hand, you can summon it again and use the Tokens for Security Dragon, because Akashic can only be summoned once per turn, and since your Security Dragon is co-linked, bounce the Grinder Golem, give it back to the opponent and summon the Tokens, then go into Firewall Dragon and bounce the Grinder Golem to give it back again, and from there you can potentially go into a Link-8 when one is revealed or you can just do more Link plays. Yeah, Grinder Golem might be banned one day. When Akashic Magician is co-linked, which my combo lets you co-link it with Firewall Dragon, you can declare a card name and excavate monsters equal to the Link Rating of the monster(s) she is co-linked to, which Firewall would be a Link-4 letting you mill 4 cards. Also if the declared card is excavated, you can add it copies excavated to the hand while the rest are going to the GY. This is a very powerful Link Monster with a ton of potential, especially with Grinder Golem. Get your copies now or in the 2018 Mega Tins if Akashic doesn’t really become broken by then. The card is begging for abuse. Ahh, look, a Spellcaster. Akashic Magician is a Link 2 Monster, with 1700 attack, who has arrows pointing directly above and below her. Link Summon is performed with two of the same type of Monsters, excluding Tokens, and you can only Link Summon one of her a turn. So first off, if Link Summoned, return all Monsters this card points to back to the respective Hand(s). Bounce effects are nice, and we’ve seen in the past how powerful and annoying they can be. She’s obviously not the strongest card, and she’s a combo card, geared for certain Decks, whether you’re using her other effect and adding cards to your Hand, or just feeding your Graveyard…or both. She can be abused absolutely, but she’s a card that might have you thinking as well, and I’m all for good cards that aren’t broken but require thought.